The toughest moments experienced by FC Barcelona football club were the initial post-war years. The Club reached a point where it almost ceased to exist. Subject to relentless repression and reprisals by the authorities, the identity of the organisation was changed completely. The purges also affected the players; anyone who had gone on the tour to Mexico and the United States was suspended for two years. Many of the players were exiled abroad. The Club’s coat of arms and name were changed because they were not deemed to be sufficiently Spanish, and the Club’s presidents were scrupulously selected by the sports authorities until 1946. The team formation in subsequent years, however, led to more promising title victories in the 1950s. For many people, Barça’s matches at Les Corts represented an oasis of freedom during years of fear, misery and repression. After the war, FC Barcelona experienced terrible times of social, economic and sporting hardships. The team did not have enough players and a bomb dropped by fascist air forces had destroyed the Club’s headquarters. It was time to start anew. The new political dictatorship distrusted Barça, viewing it as an organisation that was committed to the Republican cause and Catalan nationalism. The Les Corts grounds were officially reopened for a match on 29 June 1939. The match was presided over by various military and civil authorities. Speeches were given proclaiming that the Club would cease to be a vehicle for anti-Spanish sentiment and would become a Spanish sports icon under the new regime. With the upheaval of the war over, the team was strengthened by two player who would be pivotal in the coming years: César Rodríguez and Mariano Martín. César was one of the great goalscorers in Barça's long history. He made 456 appearances for the team and scored 304 goals. He made himself famous for his diving headers from corners, many of which ended up in the back of the net. Some years later, the team was bolstered by the arrival of Estanislau Basora, one of the best wingers ever at Barça and Antoni Ramallets, for many the best goalkeeper in the Club's history. Josep Samitier’s contribution to Barça was not limited to his outstanding performance as a player. In 1944, he began an important stage as team manager. With Samitier in charge, FC Barcelona won the 1944-45 Spanish League. It had not won the title since 1929. 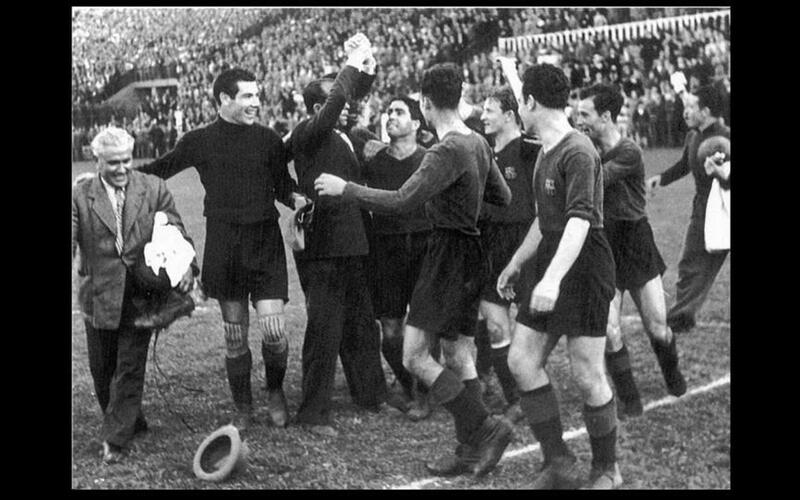 The 1948-49 season saw Barça win the Latin Cup, their first ever European title. The competition was organised by FIFA and the precursor to the European Cup. Finalist teams from France, Italy, Portugal and Spain played for the Cup. In 1949 the participating teams were Stade de Reims, Torino and Sporting Clube de Portugal. FC Barcelona beat Sporting in the final with a 2-1 victory. The Club’s 50th anniversary coincided with a time of great success, and the Club’s awareness that it had recovered from the Civil War. At this time, FC Barcelona underwent a period of growth, and had a total membership of 24,893. The Club’s foundation was commemorated with a series of events and a three-way football tournament, between Barça, Boldklub from Denmark and Palmeiras from Brazil. Barça won the tournament. Taking full advantage of this anniversary celebration and thanks to an intiative from member Salvador Grau Mora, the Club reinstated the four stripes of the Catalan flag that it had been forced to remove from its coat of arms. This was a clear demonstration of its desire to recover its identity, despite the limitations imposed by the existing circumstances. The massive turnout of Barça followers at the celebratory events that took place at Les Corts made it clear that the Club had outgrown the legendary stadium. The Uruguayan Enrique Fernández, who had played for Barça before the war, managed the team for three seasons, which resulted in two consecutive Spanish League titles in 1948 and 1949. Fernández used tactics based on attack, which were to the liking of Barça fans.